Unique Shaker vibrates to wake up heavy sleepers. Wake to iPhone / iPod, FM radio, buzzer and / or shaker. 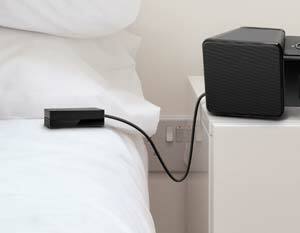 Sleep to iPhone / iPod or FM radio. Speakers play your music with depth and clarity. Programmable presets for 10 FM radio stations. Available in four stylish colors, the Vibro II boasts full, rich stereo sound and a large, easy-to-read display. This dual alarm clock will play and charge your iPhone or iPod and has a unique TimeSync button that will sync the time on your iPhone/iPod and the clock. Vibro II also displays your alarm settings right on the main screen and has programmable presents for up to 10 FM radio stations. iLuv Creative Technology is the premier provider of the most comprehensive line of accessories for the mobile lifestyle. Born in New York City, the heart of design and innovation, iLuv has evolved into a worldwide premium brand garnering both media and consumer respect along the way. What sets iLuv apart is our commitment to innovation. Our products are designed by an in-house team of industrial designers and engineers, who also meticulously manage the technology to ensure the highest quality, making iLuv products distinct both from a design standpoint and from a quality standard. iLuv is a one-stop solution for all of your mobile lifestyle needs. Find out what the buzz is all about. The Vibro II Alarm Clock from iLuv gives you that option with a unique 'Shaker' that vibrates when it's time for you to start your day. Available in four stylish colors, the Vibro II is the perfect accessory for heavy sleepers, students and couples. Heavy sleepers and the hearing impaired can rest easy knowing that if their music, radio or buzzer doesn't get them up, the 'Shaker' will. Rather than disturb their partner or roommate, students and couples can set the Vibro II to wake them discreetly using only the 'Shaker'. 4 color options (pink, white, blue, black). Unlike traditional alarm clocks, which feature a simple mono-speaker, the Vibro II was built with full-range speakers that not only play your music, but play it well. The Vibro II features a large LCD display and ten brightness levels that ensure visibility, wherever you are in the room. Keep it bright during the day and dim it in the evening to enjoy a restful night. Unlike many other alarm clocks, Vibro II allows you to confirm your alarm settings with just a glance. It's featured right under the time, so you never have any doubts about when the alarm will go off. Press the TimeSync button to sync the time settings on your iPod or iPhone and your clock, so you'll never feel out of step, no matter how you're keeping track of the time. Setting your clock has never been easier. 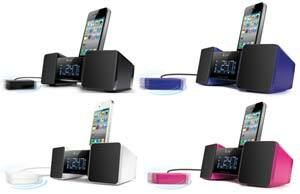 Experience enhanced sound from our speakers while quickly charging your iPod or iPhone at the same time. 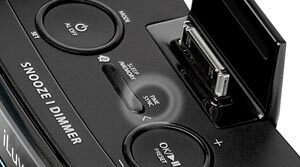 Just dock your device into the Vibro II and enjoy your music. Choose a color that suits your personal style or bedroom décor. The Vibro II comes in black, white, pink, and blue.